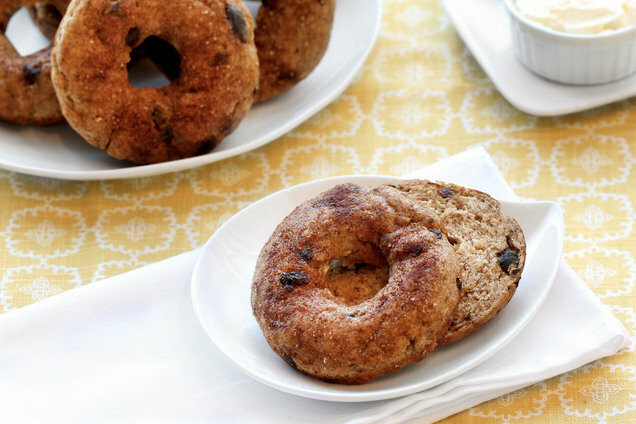 Healthy Make-Ahead Breakfast: Cinnamon Raisin Bagels! If you generally skip bagels due to their starchy nature and high calorie counts, your world is about to be rocked. These cauliflower-boosted bagels are light done right! Preheat oven to 450 degrees. Spray a 6-cavity standard donut pan with nonstick spray. Place chopped raisins in a small bowl, and cover with warm water. Soak until softened, 5 - 10 minutes. Drain excess liquid. Return cauliflower crumbs to the large bowl. Add drained raisins, flour, yogurt, 1 tbsp. butter, baking powder, 1 tsp. cinnamon, and salt. Thoroughly mix until a dough-like texture is reached. Evenly distribute dough into the rings of the donut pan (about 1/3 cup each). Use your hands to firmly form and flatten into 6 bagels. Brush bagels with melted butter, and sprinkle with cinnamon mixture. Hungry for More Healthy Bagel Recipes? January is National Oatmeal Month. Oatmeal is awesome, but don't settle for a boring bowl of oats... Check out these super-sized recipes! Surely you know some bagel fans. Click "Send to a Friend" to share this recipe now!